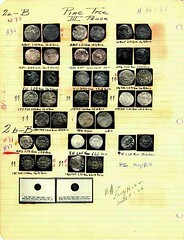 Sydney P. Noe papers, 1906-1966, bulk 1906-1918, Archives, American Numismatic Society. Sydney P. Noe was born on April 4, 1885 in Woodbridge, New Jersey. He graduated from Rutgers University, where he received his master's degree, in 1913. Two years later, in 1915, he joined the ANS as Librarian, where he reorganized the library's collection and created its photofile. Noe remained librarian until 1938, when he succeeded Howland Wood as Curator. Noe also served as Secretary for the ANS from 1917 until 1947, when he was named Chief Curator — the first person to hold that position. Upon his retirement in 1953, Noe was named Chief Curator Emeritus. 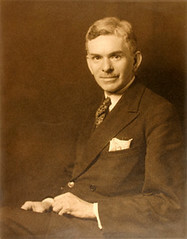 During this period, Noe also served the ANS as Editor from 1921 to 1945. While Noe served as its editor, the ANS launched two of its most significant series, Numismatic Notes and Monographs, the first volume of which was his Coin Hoards, and Numismatic Studies. Noe's interest in numismatics did not stem directly from his education. His major at Rutgers was engineering. It was while Noe was working part-time in that school's library that he was assigned the task of classifying a gift collection of coins and his fascination with numismatics began. Noe was a specialist in Greek coins, but also studied the colonial coins of Massachusetts and the hacienda tokens of Mexico. He authored more than 40 monographs and articles, mainly in the field of Greek numismatics. His published works, in addition to Coins Hoards, included A Bibliography of Greek Coin Hoards, The Pine Tree Coinages of Massachusetts, and Coinage of Caulonia. Noe was named a life fellow of the ANS in 1919 and a patron in 1968. Noe received the ANS's Archer M. Huntington Medal Award (1938), as well as the Medal of the Royal Numismatic Society (1949). Upon his retirement in 1953, Noe continued to come to the ANS several days a week. In 1965, the ANS Council presented Noe with a gold medal to commemorate his half century of service to the Society. Noe died in 1969 at the age of 84. Includes correspondence from Noe’s time as a student at Rutgers and for several years after his graduation (1908-1918), with topics including family news and personal matters; his work as assistant librarian for John C. Van Dyke at Gardner A. Sage Library, New Brunswick Theological Seminary; traveling abroad to study art for the first time (1911); letters from former seminary students working as missionaries, including one from Henry Vruwink mentioning the use of peyote among the Cheyenne and Arapaho Indians (1914); his work as a church organist; his brief articles on art for The Associated Newspaper School and the Mentor School; applying for positions at the Metropolitan Museum of Art in New York and the Museum of Fine Arts in Boston and for a fellowship at Princeton; and letters from publishers declining to publish his master’s thesis The Metropolitan Museum of Art, Critical Notes on the Paintings (1915). Correspondents include John H. Warnshuis, H.E. Boggs, Raymond D. Shepard, Effie Bignell, James Dykema, Stephen W. Ryder, and Ted Walser. Also includes Noe’s term reports from Rutgers (1907-1910) along with a letter (1906); an order of exercises, a bill, and other items from Rutgers; a notebook with notes on paintings from his time at the Sage Library; American Numismatic Association membership cards (1909, 1910); clippings of Associated Newspaper School articles; a disability policy (1911); check stubs (1912); an identification card with a photograph (1913); a fishing permit (1915); a bank book from the National Bank of New Jersey (1910s); two dance cards; and a corrected draft of his master’s thesis The Metropolitan Museum of Art, Critical Notes on the Paintings. The later materials are letters from G. &. C. Merriam regarding editing of a dictionary (1930-1934); a certificate electing Noe as a member of the American Antiquarian Society (1945); and letters pertaining to the commemoration of his 50-year relationship with the ANS (1965-1966); and a color photograph of Noe (ca. 1966). One group of materials (Box 4) relates to his published work on the colonial coins of Massachusetts and includes notes, pages from published works, two letters (1942, 1948), plate layouts, and photographs of pine tree, willow tree, and oak tree coins from the following collections: American Numismatic Society, W.B. Osgood Field, Massachusetts Historical Society, Museum of Fine Arts, Boston, J.S. Gensheimer, Yale University, Mabel Brady Garvan, St. Louis Stamp and Coin, Carl Wertzach, S.H.P. Pell, T. James Carke, Stephen Ryder, and Douglas P. Dickie. 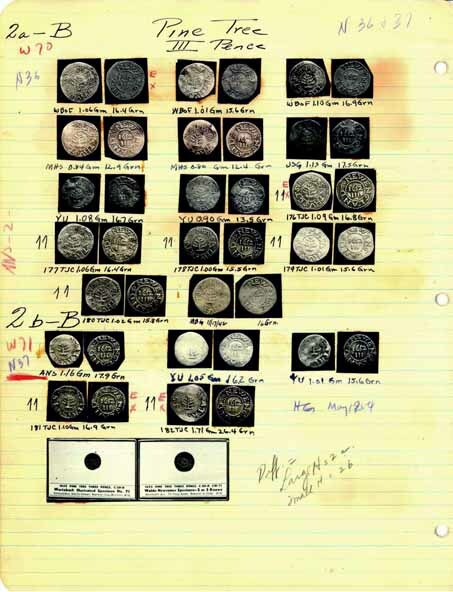 These photographs appear to be of the coins gathered for ANS’s exhibition on early American coinage held in the spring of 1942 (see ANS Proceedings, 1943, p. 4).